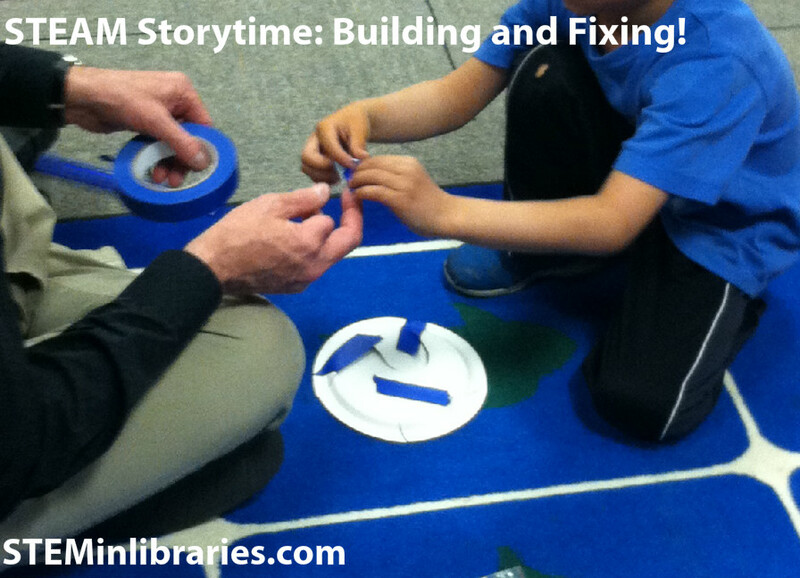 Program Title: STEAM Storytime: Building and Fixing! Half-storytime, half-lab in which we explore how things are made and fixed. Cost: $$ 50-100, assuming that you don’t buy the Giant Pipe Builders set, but DO buy a bunch of PVC pipes and a lot of tumblers. Otherwise, it’s very cheap! We already had the Giant Pipe Builders and tumblers, so this was an extremely low-cost program for us. –Cut each paper plate into 3-5 pieces of varying size/shape and put each one in a Ziploc baggie. Make 1 per participant. -Cut a handle on the top of each legal envelope, like shown here in LibrErin’s post. -Print 1 tools coloring sheet on cardstock per participant and cut out each of the tools. Put each completed set into a completed envelope. -Gather a variety of sizes of empty cardboard boxes and tape them shut. 3. Brainstorm: What kinds of things do people build? Have you ever had a toy break? Have you ever seen a bump in the road? Have you ever seen a flat tire on a car or bicycle? What happens when the things that people make are broken? We fix them! Five little nails, standing straight and steady. Bam Bam Bam! That nail goes down. Now there are just four nails to pound. Repeat until there are no nails left. (Child #1’s Name) pounds with one hammer, but (Child #2’s Name ) pounds with two! (Child #2’s Name) pounds with two hammer, but (Child #3’s Name) pounds with three! (Child #3’s Name) pounds with three hammers, but (Child #4’s Name) pounds with four! (Child #4’s Name) pounds with four hammers, but (Child #5’s Name) pounds with five! (Child #5’s Name) pounds with five hammers, and Miss (Your Name) goes to sleep! Start out by pounding 1 fist, then 2 fists, then 2 fists and a foot, then 2 fists and 2 feet, then 2 fists and 2 feet while nodding your head. At the end, make a sleeping motion. The bathroom or the kitchen. A plumber has to fix them. We need a plumber quickly! One of our fabulous maintenance guys drilled a hole in the bottom of a large plastic bowl. We held the bowl over a basin and poured water through it–of course, it leaked. We asked the kids what we could use to repair the hole. Paper? Aluminum foil? An apple? Clay? It was fun to ham up the silly options before finding one that worked to hold the water in. 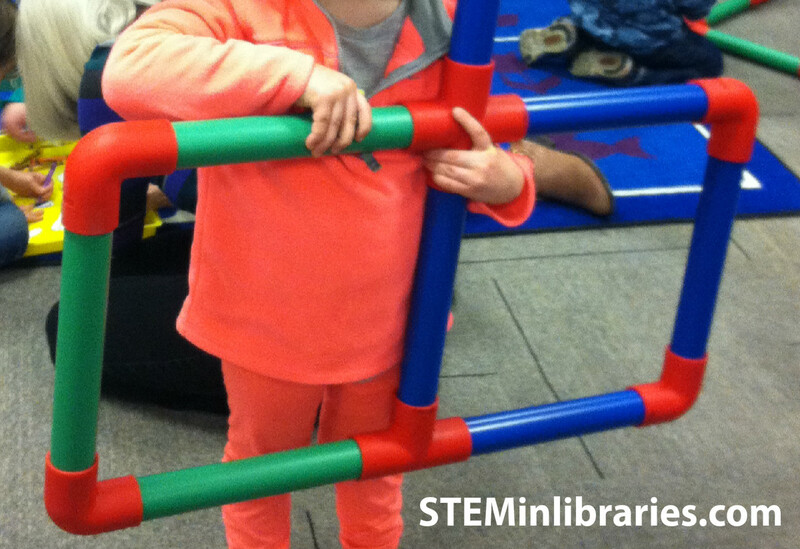 We have two sets of Giant Pipe Builders from Lakeshore Learning and many sets of these colorful stackable tumblers from Ikea as part of our “Hands-On Science Museum.” Kids love to use these two building items together, so we put them all out at one station for free building time. We got a great many boxes donated to us from staff members and our maintenance crew. All we had to do was tape them closed and haul them into the meeting room. 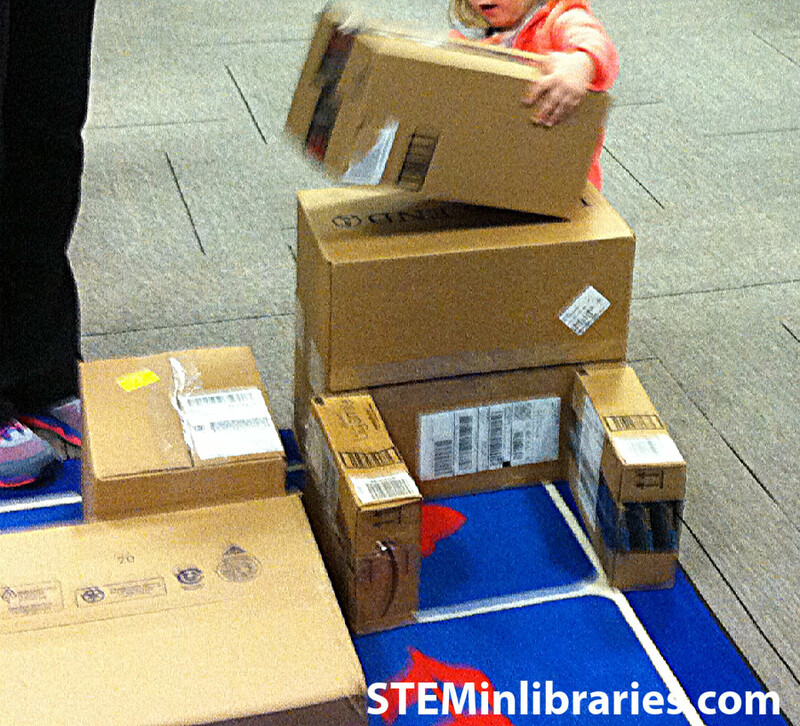 As usual, the kids loved playing with the boxes more than any other thing in the entire room. Boxes always trump everything! This is a highly recommended free play activity. This completely amazing idea came from LibrErin’s blog. Each participant gets a baggie with cut-up plate pieces, and their task is to reassemble the pieces with colored masking tape. As Erin did, we also put out rulers so that they could measure plates or other things around the room. Again, LibrErin rocked our world with this simple, wonderful craft idea. The beauty of taking the time to cut out all of the tools and separate them into the envelope “toolboxes” in advance is that if the kids took too much time with the free building activities (which they did), then they could just take one of the toolboxes home to color later. No fuss, no muss. Amazing! LibrErin: STEAM Storytime – Fix It, Build It! We would not change anything. This program worked very well as-is. No recommendations for adapting up or down.